File Card ID Size: 3 1/2" x 5 1/2"
Material Thickness: 10 mil = .010"
TFC-L Teslin File Card (Jumbo) 1-up - Laser. 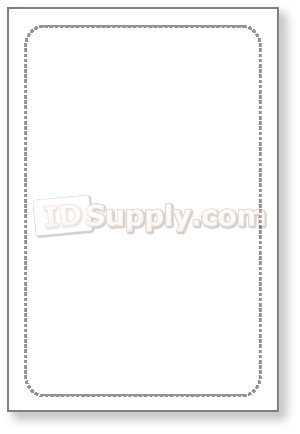 This one-up Teslin sheet has one micro-perforated 3 1/2" x 5 1/2" Teslin card insert. The Teslin insert will remove cleanly from the sheet and when inserted into one of our file card size Butterfly Laminating Pouches it will form a borderless rigid ID Card. The overall printer sheet size is 4" x 6". A template for this sheet is built into EspressoID software.